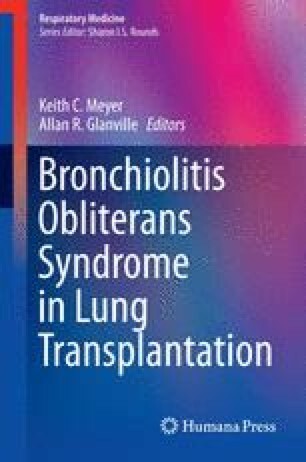 Many risk factors and post-transplant events have been linked to the development of bronchiolitis obliterans syndrome. Evolving research suggests that the development of cell-mediated and humoral reactivity to self-antigens (collagen V, K-α1 tubulin) in the lung allograft may play a very significant role in the bronchiolar inflammation and fibrosis that lead to obliterative bronchiolitis and progressive graft dysfunction and loss. Alloimmune and autoimmune mechanisms likely work together to mediate chronic lung allograft rejection. This chapter examines the role of autoimmunity in bronchiolitis obliterans syndrome with a focus on the role of Th17 lymphocytes, IL-17, and immune regulatory mechanisms in the development and progression of obliterative bronchiolitis.